Getting links back to your site is the number one most important factor to getting ranked well in the search engines. What are some link-building strategies that really work? Though many of these links are no-follow links, the exposure will often get you in front of other people who will create permanent links to your site. Have a Facebook group or fan page. Also make sure the like button and the retweet button are both on all the pages that you want people to link to. Create content designed to spread virally on sites like Reddit and Digg. What tends to do well on these sites? * Infographics tend to get a lot of attention. Put a bunch of little-known statistics into one infographic. * Content relevant to a news topic that these groups support. They tend to be more liberal than conservative and also more technologically oriented. There are many sites in your industry that depend on outside articles for their success. And so on. Try to find websites that regularly host other people and try to get an article on their sites. Directories are one easy way to build a bunch of backlinks quickly. You can submit them by hand or hire out the process very affordably in internet marketing forums. Send press releases to news services like PRWeb, PR Newswire and PR Leap. Some offer free press release services, though typically you’ll have to pay a small amount of money. These releases will almost definitely generate a handful of backlinks to your website. If your story is especially good, you may even get picked up by news media or a prominent blogger and get a high profile link. One easy, high quality link is to get a link from your chamber of commerce. All you need to do is show up at your local chamber and register as a business. They’ll then put a link to your website from their high authority, high PR site back to your site. Forums and blogs are two easy places to get links. The most important thing to keep in mind with these link sources it that every post you make should be a high quality post, not a junk post designed just to get a link back. Write high quality responses in forums and blogs and include a link back to your website. You’ll build both your backlinks and your credibility in the field as you get more well know. There are many link-building techniques out there. While some work more than others, they all work to some degree. The most important thing is that you get out there, take action and start building links today. Content – The first and most important way to attract incoming links is through great content. When you publish content that is entertaining, valuable and informative people will naturally link to your website or blog. Content can be video, audio, print or any combination. The essential element is that it is worthy of being linked to. If you are having a hard time coming up with great content, try outsourcing to someone who loves writing. Check out Happy Outsourcing by Rachel Rofe: a great step by step plan that anyone can use right away. Social networking – Once you have great content on your website you can use social networking to generate attention. Post links to your best content on your social networking site of choice. Interact. Generate awareness and attention for your website. People will notice your website and again they’ll naturally link to it. Blog (and guest blog) – Blogging is another natural way of creating content. When you publish guest blog posts then you are reaching a new audience. The more attention you generate for your website, the more people will link to you. Additionally, you can create a blog to support your website. This blog can link to relevant content and web pages to help increase incoming links. Online directories – There are a number of online website directories. Simply register with the directories. They can provide a few powerful incoming links.You can also list your business website with local search directories like Google Places. It’s free. It’s easy. And it’ll generate a few quality incoming links. Social bookmarking – Social bookmarking sites like StumbleUpon and Digg can provide incoming links. Join a few bookmarking sites. Create a profile. Interact with others much like you would on a social networking website. Bookmark web pages that you like. Also, when appropriate and relevant, bookmark a few top-notch pages on your own site. This process boosts awareness for your website. Other people will bookmark your pages. And the pages you bookmarked will receive attention and incoming links. Content marketing – Publish articles on article directories and other people’s websites. This actually generates a substantial amount of incoming links. Also consider creating syndicated content. You might publish a newsletter. In each newsletter you’ll have an article or two. You can include a snippet that tells others they can publish the article if they don’t change it and if they keep your links and bio. When your content is top level, people will publish your articles on their site with the links intact. Press releases – Finally, consider publishing press releases when you have news to share. Use services like PRWeb to distribute them. It’s another great way to generate incoming links. Incoming links help you climb your way to the top of the search engine rankings. They boost traffic. Create a plan today to start increasing your links and grow your business. For more non-stop, viral traffic ideas, click here. Google Website Optimizer is the most popular split testing platform online and it’s also 100% free. To get started, go to Google Website Optimizer and start by clicking on “Create an Experiment.” You’ll be guided through the step by step process of setting up a split test. 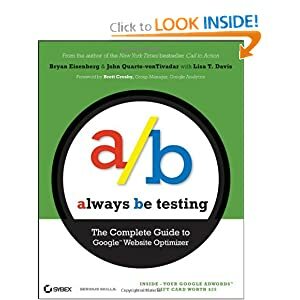 If you choose to do an A/B split test, you’ll basically set up two different pages and Google will automatically split the traffic for you and report the results. If you choose to do a multi-variable split test, you’ll have a single page with different PHP codes on the page that publishes different versions of each variable every time the page loads. Once you have a split test setup, Google will show you data on your visitors, conversion and conversion rate on your front page. It’ll also tell you how far you are from having statistically significant data. For example, if you have enough results that Google is 75% sure you have a winner, it will tell you that. You can then decide if that’s good enough for you and call the test complete, or you can wait for more data to be closer to 100% certain. Split testing is the practice of continually improving your website incrementally over time. The way it works is you create two or more versions of the page you want to test, each one slightly different than the other. You “split” your traffic between these two versions and see which one performs better. For example, if you’re selling a dog leash you might split test two different images: One of a dog on a leash, another of a pet owner who’s smiling. After testing the images, you might find that surprisingly the pet owner smiling brings in more sales than the dog on a leash picture. Instead of just creating a site and hoping that it sells, split testing allows you to increase your conversions over time. There are primarily two different types of tests you can conduct: A/B tests and multi-variable tests. A/B tests are the tests we talked about above, where you test two different sites and see which performs better. It’s called A/B because there are two sites, one called A and the other called B. The other type of test is called multi-variable testing. It’s a type of testing where you test many variables at once and use software to mathematically figure out the best combination of variables. For example, you might test the headline, the layout, the picture, the price and the order button – All at the same time. The software will tell you which is the best combination of all the data. Multi-variable testing is generally used only once you have a lot of traffic. For our purposes, we’ll go over how to run A/B tests in this report. What Should You Split Test? There are a few things that affect conversions more than anything else. Start by testing these factors, then test less important factors later. The price will often affect your conversions more than anything else. Should you charge $20, $40, $80 or $100? The only way to really know is to test it. Be careful when testing prices. Generally you want to test it only for a limited time, or else you’ll be sending mixed messages to your market about what your price is. If someone buys a product and later realizes someone else paid less, always refund the difference for them. Next to the price, the headline is often the highest impact factor to test. The headline’s main job is to capture the reader’s attention and get them to keep reading. It’s their first impression to your website. If you spend 50% of your copywriting time on your headline, that’s time well spent. Split testing your headline can have very, very dramatic results. The layout speaks to your users emotionally, non-verbally. By layout/design, I mean things like: font color, font size, width of the page, background color, etc. Studies have shown that certain layouts can increase conversions quite drastically in certain markets, while reducing conversions in others. For example, red headlines tend to work great in markets that aren’t heavily marketed to. In markets like marketing, weight loss and dating tips however, people are so sick of seeing red headlines that a red headline actually reduces conversions. Instead, a deep blue headline which builds trust actually tends to convert best in these low-trust high-competition markets. Each market is different. After you’ve tested your price and headline, start testing your layout to see what converts best. One thing marketers often forget to split test is the shopping cart’s drop out rate. In other words, once someone clicks “buy” what percentage of them actually completes the transaction? Online, the drop off rate can be as high as 50% or more. With split testing, marketers have been able to cut down their shopping cart drop off rate by as much as half, effectively doubling their income. 1) Making sure the shopping cart page looks like the rest of the site, so a buyer doesn’t feel like they left your site when they hand over their credit card. 2) Safety. This is perhaps the #1 factor to lowering shopping cart dropoff. If you can help your customers feel safe giving you their credit card, they’re much more likely to be willing to pay. 3) Symbols like the “BBB Certified” symbol, “128 Bit Encryption” symbol and the “Hacker Safe” symbol have all been proven to increase conversion. What is “Statistically Significant” Data? One word that you’ll often hear in conjunction with split testing is “statistically significant data.” What does that mean? It basically means you have enough data to know that if the test continued indefinitely, the results will be similar. For example, if you flipped a coin 5 times and you got 4 heads and 1 tails, it would not be accurate to say that you’ll get tails 1/5 times by flipping a coin if you did it 1,000 times. You just haven’t flipped the coin enough times to get statistically significant data. On the other hand, if you run an A/B split test and find that out of 5,000 impressions one made 100 sales and another made 20, you have enough data to know that #1 will outperform #2 if you gave it a million impressions. Any time you’re split testing, you want to make sure you have enough data that you’re getting statistically significant data. Meaning you have enough results to know that the data will stay constant when it’s scaled up. There are a lot of different software out there to choose from, but Google’s is the most common and it’s also free. So, let’s start off by learning how to use Google Analytics to track visitor behavior. If you don’t already have a Google account, sign up for one now. If you already have one (through Gmail or Blogger,) sign into your account. If it’s your first time, Google will present you with a brief tutorial of their system. Go through the system the tutorial to get a feel for how the system works. Once you’re at the main analytics page, click “Add a Website” to get started. Follow the on screen instructions to install analytics. After giving it the domain you want to track, Analytics will give you a snippet of code that needs to be placed on your website. If you’re building the site yourself in Dreameaver, XSitePro or through another editor, just paste that snippet of code before the </body> tag at the bottom of the page. Make sure you put the code on the bottom of every single page of your site, not just on the home page. This will allow you to get data for your entire site rather than just one page. Once you’ve setup the code, go back to Google Analytics. Click “edit” next to your newly setup site profile. At the top of the page, Analytics will say “Tracking Not Installed.” Next to it will be a refresh button. Click the refresh button. If Analytics now tells you that tracking is installed, that means everything is working properly and Analytics is now gathering data. – Was the domain typed correctly throughout the whole process? – Was the code copied in its entirety? – Was the edited HTML file uploaded, not just edited? Back trace your steps and make sure you did everything right. If all else fails, try just re-uploading your files and hit refresh again. When you get to the Google Analytics results screen, you have quite a lot of options to choose from. One of the most important things to learn is how to use the date range selector. This tells Google what period of time to look in when it gives you data. If you want to see all the data from all the traffic you’ve ever gotten, you can do that. If you want to just see last week’s data, you can do that too. Just select the dates. The main data screen is the data that’s centered, taking up the most space. Analytics separates its data into different modules that you can easily take in. On the left sidebar is where you choose what kind of data you want to see. You’re presented with options like Visitors, Traffic Sources, Dashboard, etc. Each link should be pretty self-explanatory. Just click your way through and see what you can learn about your visitors in each of the subsections. Once Analytics is setup, all you really need to do is come back to Analytics and find whatever data you want, whenever you want. It’s generally a good idea to check your stats at least once a week. If you’d rather not use Google Analytics, another great choice is Piwik. Piwik is free and open source. Rather than being web hosted, you download the software and install it on your own server. Piwik offers about the same functionality as Google Analytics, with the downside that it’s harder to setup and the upside of not having your data on anyone else’s systems. The choice of which to use is yours.